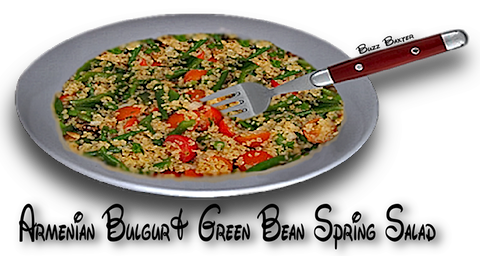 ARMENIAN BULGUR & GREEN BEAN SPRING SALAD. This is my version of what an Armenian Spring salad should look and taste like. 1. Bring the broth to a boil in a pan and add the bulgur. Stir,  put a lid on the pan and turn off heat. Let stand for ½ hour until all the broth has been absorbed. 3. In a skillet,  saute the onions in a Tablespoon(s) of oil until soft. Add the tomatoes  mix together and turn off the heat. Let cool. 4. When all the ingredients have cooled,  mix  every thing together and toss with the vinegar and oil. Salt and pepper to taste.